As a kid, one of the movie genres I really just consumed was the pulp series put out just after the Depression, stuff like Charlie Chan, Lone Ranger, Mr. Wong, Detective: stuff my grandparents knew from when they were young. Good movies, fun, I really enjoyed them. Boris Karloff as Fu Manchu. Notice how facial features have been changed: eyebrows arched, eyes have been taped to give them slants, mustache added in stereotypical “Oriental” style. But as an adult, I don’t get the same amount of pleasure from them when I try to watch them. The big reason is that a lot of the movies I was exposed to are face movies, or at least have face characters. I hope that I don’t seem like I’m bemoaning the fact that my liberal leanings are forcing me to avoid these movies, because that’s not what i’m trying to do. If you aren’t sure what I’m talking about, the most well known example is blackface, but it is also manifested for other ethnic groups, redface for Native Americans, yellowface for Asian, etc. Ok, so what is the problem? The portrayals are inherently racist and serve as very powerful visual rhetoric. Visual characters like this seek to establish themselves as typical of African-Americans. Lips and hair has been embellished, as has the overall backwards-ness of appearance. Well, like I said, these portrayals are inherently racist and in the least appropriative. Too often, the characters in “face” makeup are bumblers, lazy, slow, vain, greedy, subhuman. This establishes a stereotype, and the face character is a visual cue; audiences know what to expect from them when seen onstage. Being able to recreate the same features from actor to actor for a face role is a visual manipulation, allowing the movie makers to disregard the diverse realness of humanity and reduce POC to an idealized icon. What POC are actually like is not important. The negative is idealized, exaggerated, and displayed, in order to broadcast/reinforce the message that these aspects are all the targeted culture is. In doing this, POC go from individuals to characters that the audience doesn’t need to get to know; they already understand how they will act. The face character-one person, one role, one character, is allowed to stand for the whole people. Such characters are visual affirmation of race myths. 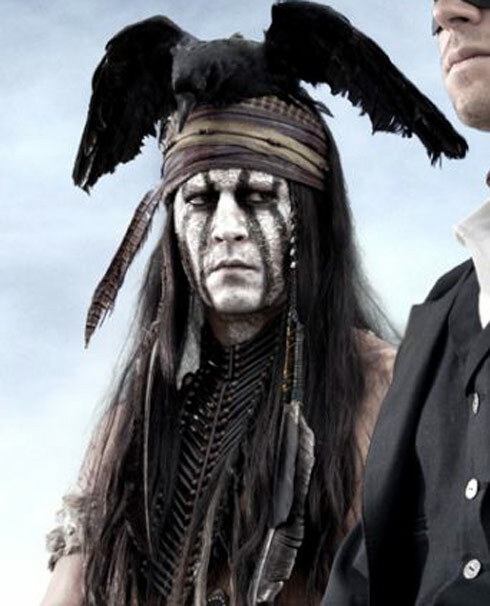 Johnny Depp’s recent portrayal of Tonto continues the traditions of redface: facepaint, broken English, quasi-mysticism. Is this how we perceive Natives? These performances do not encapsulate the whole experience of the culture or do them real credit. (There is also the cruel twist: black/red/yellow face performers have also been members of the culture they are stereotyping, often it was the only work they could get. However, this only served as an affirmation of the performance’s reality.) Face performances, in picking and choosing what they want to convey, confirm the idea that the races being mocked are this way, and so deserve to be mocked, and treated as inferiors. We must also remember that these roles are created by a dominant section of society, and are therefore used to reinforce their position of power.